Many buyers ask us “what is title insurance and why do I need it?” Title insurance is basically what the name infers: insurance that protects your title to a piece of property. Similar to auto or homeowners insurance, this protects your investment. In order to qualify for a loan, lenders require a buyer to obtain title insurance. Title insurance is a one-time expense that protects the buyer from financial loss due to defects commonly found in public records. Without title insurance, these problems could result in losing your home. In addition to examining the title records to a property, a title insurance company will search for open permits, code violations and liens by municipalities. Navigating the waters of today’s risky real estate market requires buyers to have competent and skilled professionals on their team. Selecting your own title company will ensure that you have a real estate attorney or title agent working on your behalf to protect your interest in one of life’s most significant investments, your home. 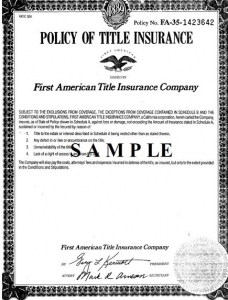 What does a title company actually do for you?